Conquest offers a series of youth ministry packages for adult and teen leaders, as well as for the boys themselves. These packages and kits change each year and are crucial to implementing and running the Conquest groups effectively. We also offer 2 add-on packages for younger boys K-4th grade to help build a pipe-line into the Conquest middle and high school groups. The 2018-19 Packages and Materials are NOW available on the Conquest Store! The 2018-19 Conquest Annual Membership Package contains all the essential materials necessary for a youth minister, adult leader, or volunteer to effectively get Conquest started this year for any size group of boys. 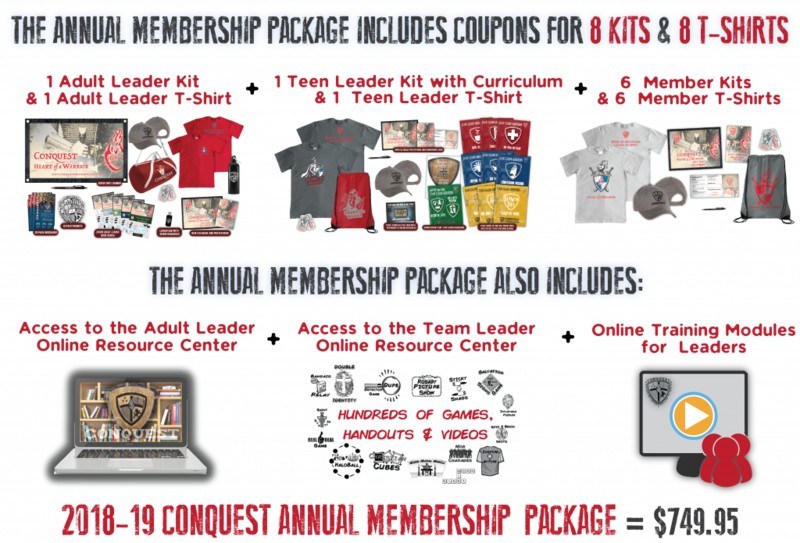 The package that is renewed annually includes an Annual Membership License, 1 Conquest Adult Leader Kit and Adult Leader T-shirt, 1 Conquest Team Leader Kit (with Curriculum Grade Level of your choice) and Team Leader T-shirt, and 6 Conquest Member Kits and 6 Conquest Member T-shirts. How can I get the material I need?